Welcome from Dr. Scott A. Campbell & Staff ! Thank you for visiting our website. Please take a few minutes to find out more about our award winning family dental practice. Our office is located 20 minutes north of Columbus in Delaware, Ohio. 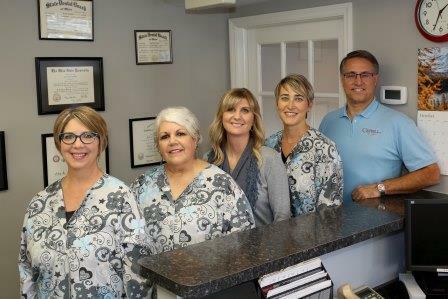 We have an open friendly atmosphere; and we offer a wide range of dental services for you and your family from a caring, small town practice. Take a few moments to add our contact and location information to your phone for the easiest way to come See-Us-And-Smile ! Dr. Campbell is a great caring dentist! My wife and myself have been going to him for our dental care for many years. He does a fantastic job from checkups to crowns and surgery.. And an oral checkup with him is a true checkup! He found an issue with my wife and referred her to a oral specialist. Not too many dentists take the time for a real oral exam. And we like his practice also because , unlike going to a dental “company” where you never know who you will see, Dr. Campell IS the dentist, making your checkups more personable! Searching for a local dentist? Look no further than with Scott A. Campbell DDS in Delaware, Ohio. Let us help you with your dental needs. Call 740-443-4423.